In the final review of my little black metal trilogy, I'm revisiting another solo-project that has been featured a few times before. Moloch (Ukr) has been super prolific over the last few years and thanks to the help of a myriad of DIY and independent record labels, has been able to release more than his fair share of music recently. Already in 2014 Moloch has released a split 7" with Japanese black-thrash band Sabbat and now comes the 12th full-length, Verwustung. I know Moloch as a very measured black-ambient band. By that, I mean that Sergiy doesn’t rush things and lets songs build of their own accord. Opening track Todesstille is an extended instrumental track making use if Moloch’s ear for atmospheric ambience. As with my two previous reviews, Moloch’s creator plays all the instruments and delivers the vocals, without too many outside influence/hindrances (delete where applicable). Blutmond is the first glimpse at Moloch’s blackened blueprint. Sergiy has stated the for the first time, the song lyrics have been written in old English and Latin languages, as opposed to his favoured Russian/German tongue. while you may struggle to decipher the specific language amongst the icy screams, there’s no denying that Moloch new, catchier sound and songwriting shows a clear progression. There is plenty of metallic bite from the guitar during Spiritueller Selbstmord and the haunting choral singing that site just behind adds a great new texture to Moloch’s music. 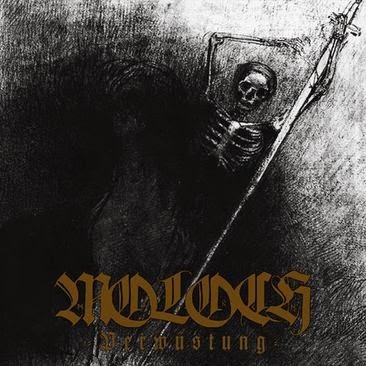 The production and mastering on Verwustung seems to have vastly changed Moloch’s sound and even though the step up isn’t huge, it still makes you forget that this is but one man. Negativitat sounds mighty yet still manages to hang onto enough live atmosphere. The new and more focused song lengths also go a long way to improving the listening experience on Verwustung. Nur Der Tod Ist Wirklich lasts just over four and half minutes but contains all the momentum needed to keep you hooked. The pitches of Sergiy’s screams during Die Kalte Der Ewigkeit hark back to some of his previous releases, where he seems to take on various maddening souls, that emit themselves through his vocal chords. It’s harrowing stuff for the uninitiated. Moloch takes things down a more minimalist route with the intro of Du Bist Nichts In Dieser Sterbenden Welt. It’s quiet and lowly to begin with, but don’t let that fool you as it’s the last full black metal song on the album and as a result, it’s a bit of a scorcher. The closing title-track is also instrumental and once again ensures that there is a nudge of ambience floating through the release. Whats different about this piece is the improvisational piano that fluctuates through it. It has a slight resemblance to the music from Silent Hill:The video game (how many times have I said that about ambient music!). All in all, this is probably the best body of work I’ve heard from Moloch. It shows a new, more focused approach and is something that I’ll definitely be listening to again and again. If you’re already a fan of Moloch or want somewhere to start, this is probably a decent place. Firstly, from the above Bandcamp page along with other merch packages. Suffering Mind/SixBrewBantha - Split 7"
Mean Little Blanket - Blast Off! Wits End/Human Hands - Split 7"